A week after the UFC held an event in Hamburg, Germany, they return to action at the Quicken Loan Arena for there first ever event in Cleveland! 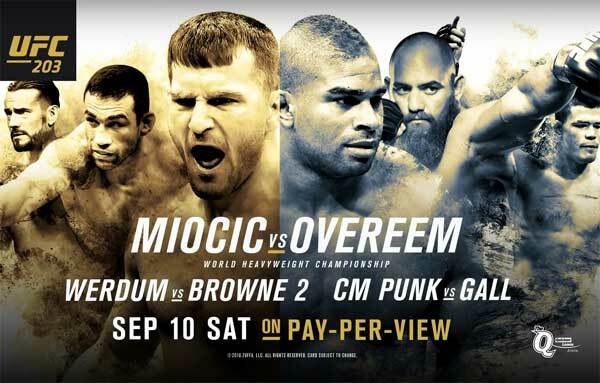 Headlining the card is Cleveland’s own and UFC Heavyweight Champion Stipe Miocic, who will look to make his first title defense against Alistair Overeem. Miocic, captured gold at UFC 198 against Fabrico Werdum, continuing the UFC Heavyweight Championship’s pattern of changing hands. The challenger Overeem, enters this contest on the heels of a four-fight win streak, including three via stoppage. Perhaps his most impressive victory of the four comes by way of knocking out the former UFC Heavyweight Champion Junior Dos Santos. Co-headlining the card, is the former UFC Heavyweight Heavyweight Champion Fabricio Werdum, who like I mentioned before, lost his title to Stipe Miocic at UFC 198. His combatant comes in the form of Travis Browne, who is coming of an absolute beat down by the hands of the former UFC Heavyweight Champion Cain Velasquez. Notice the amount of former UFC Heavyweight Champions being mentioned? Anyways, Browne jumps into this contest as a late replacement for Ben Rothwell and looks to even the score against Werdum who defeated him way back at UFC on Fox 11. Also on the card is the debut of WWE superstar CM Punk, who takes on the winner of the golden ticket, Mickey Gall. It should be intriguing to see what Punk has to bring to the table after two years of going through injuries, training and ultimately preparing for this moment. Some other bout on this card include Urijah Faber vs. Jimmie Rivera, Joanne Calderwood vs. Jessica Andrade and Bethe Correia vs. Jessica Eye. Anyways, let’s get to the Predictions! 265 lbs. : UFC Heavyweight Champion Stipe Miocic vs. Alistair Overeem – What an awesome heavyweight title fight, as you have a world class striker in Alistair Overeem against a wrestler with legit striking and power in Stipe Miocic. For the challenger Overeem, he heads into this bout on a four fight win streak, including three via devastating knockouts. His streak has earned him his second UFC title shot, but the first he will actually fight in. If you recall, after defeating Brock Lesnar at UFC 141, Overeem was promised a title shot. However he failed to hold up to his bargain, as he failed a drug test and in result was pulled from the fight against then Champion Junior Dos Santos. Overeem has since bounced back from the failure, although it was immediate, as he lost three of next four fights via knockout. On the cutting block, “The Reem” has made the most of his new found life and the thanks should go to changing camps to Jackson-Winks. Champion Miocic will look to end the Heavyweight curse, that has had the Heavyweight title bouncing around like a hot potato. And if anyone can do it, it just might be Stipe Miocic. I say that because he considerable has less miles on him than most Heavyweights and skill-wise, he’s just about the complete package. Miocic will look to extend his three fight win streak, in which he’s knocked the heads off Mark Hunt, Andrei Arlovski and Fabrico Werdum. As for a prediction, I’m leaning towards “And New”. I only say that because Alistair Overeem is a changed man since his move to Jackson-Wink’s. He’s combined his already elite striking abilities, with some patience and technique. And in changing his ways, he’s become less hittable and more elusive. Plus, people sleep on Overeem’s grappling abilities. He’s actually very solid in that department and I bet will be able to fend off most of Miocic’s takedown attempts. When he does, he’s going to pinpoint the strike that puts Miocic away in the 1st round! 265 lbs. : Fabricio Werdum vs. Travis Browne – This is a rematch, as the two fought back at UFC on Fox 11 in a title eliminator fight. Werdum would wind up upsetting Browne, which set him up to fight Cain Velasquez. However after Velasquez pulled out of the bout, in stepped Mark Hunt in a fight for the Interim Heavyweight title. Werdum would capture the Interim strap and ultimately unified the belts after submitting then Champion Cain Velasquez. As for Browne, since the loss Werdum, he’s gone 2-2 and has never really been able to build the same momentum that got him a fight away from a title shot. On the hand for Werdum, this will be his first fight since losing the title to Stipe Miocic at UFC 198. Originally the opponent was supposed to be Ben Rothwell, but he pulled out due to an injury and in stepped Browne. As for a prediction, I’m siding with Werdum. Between his striking and world class BJJ, he just has to many ways to win this bout. And I really think Browne is heading into this bout way too soon from his thumping to Cain Velasquez. So with that, I have Werdum via submission. 170 lbs. : CM Punk vs. Mickey Gall – Is there a real way to predict this fight other than saying the MMA fighter beats the WWE import? Nope…and as Charlie Day would say “Wildcard” – CM PUNK via TKO! 135 lbs. : Urijah Faber vs. Jimmie Rivera – The “California Kid” Urijah Faber is 19-1 in non-title fights, which gives him a 95% win rate. That’s pretty dam impressive and what’s crazy, is that it took a bout against Frankie Edgar in 2015 to break the perfection. Anyways, Faber is most recently coming off a defeat to UFC Bantamweight Champion Dominick Cruz, which gave the 2-1 nod to Cruz in the trilogy. It also marked Faber’s fourth time Faber fought for UFC gold, coming up short in all four. His combatant Jimmie Rivera, is on an 18 fight win streak and only tasted defeat once, back in 2008. Rivera is 3-0 in the UFC and this by far will be his toughest opponent to date. As for a prediction, I can’t go against Urijah Faber. And I know he’s probably never going to receive another title shot, but he’s always been in the top five forever. So with that, I got Faber taking this via decision. 115 lbs. : Jessica Andrade vs. Joanne Calderwood – What a great and tough fight to call. I’m still puzzled how in the world Jessica Andrade dropped 20 lbs. and is fighting at Strawweight now. And I would of thought in her debut, that she would gas, but her tank was still full and she was swinging leather at a ridiculous pace. Her combatant Joanne Calderwood looked equally as exciting in her fight against Former Strawweight title challenger Valerie Letourneau. It was pleasant to Calderwood finally tap into her potential, as injuries, personal issues and an odd defeat to Maryna Moroz set her back. As for a prediction, I’m siding with Andrade. I just like her overall game and despite coming in the shorter fighter, her Lineker-esque style is going to earn her the nod here. Pressure and bunches and punches by Andrade, get her the win via TKO. 135 lbs. : Bethe Correia vs. Jessica Eye – A fighter that needs a win more than anyone in the UFC, would probably be Jessica Eye. She’s lost three consecutive fights and four of her last five. And I can’t she looked good in the defeats, as she’s mostly on her back the entire fight due to her poor takedown defense. As for Correia, the former UFC Bantamweight title challenger is on a two fight skid, most recently losing via split decision to Raquel Pennington. Correia is mainly a striker, which bodes well for Eye, who as I was saying has been defeated handily because her lack of wrestling abilities. As for a prediction, I’m torn, but I’m going with Jessica Eye here. I think with her back up against the wall and fighting in her hometown, she’s going to come out on all cylinders and win this fight via late TKO. 145 lbs. : Nik Lentz vs. Michael McBride – I have no clue who McBride is, other than he’s a late replacement. Unfortunately for McBride, he has to face a grinder in Nik Lentz. In other words, Lentz via decision. 265 lbs. : Caio Magalhaes vs. Brad Tavares – This is a tough fight to call in the middleweight division, as one hand you have a well-rounded and pretty patient fighter in Brad Tavares and on the other, you have an aggressive madman in Caio Magalhaes. Tavares, has been out of action for over a year, with his last bout lasting 44 seconds in defeat to Robert Whittaker. His combatant Magalhaes is coming off a first-round defeat to Josh Samman, in which he was suspended for 6 months due to spitting on Samman after the bout. Anyways, as for a prediction – despite his suspect gas tank, I’m going with the power of Magalhaes to overwhelm Tavares in the very first-round. Magalhaes via TKO! 170 lbs. : Drew Dober vs. Jason Gonzalez – No clue who Jason Gonzalez is, but Dober is a guy who’s been the product of some weird fights. I mean, from his opponent Jamie Varner knocking himself out to a referee stopping a bout that saw him in a guillotine choke, in no danger and in the midst of escaping. Anyways, I got Dober winning this via decision, with his high volume striking mixed with some takedowns. 155 lbs. : Yancy Medeiros vs. Sean Spencer – Medeiros is coming off an exciting bout against Francisco Trinaldo, which in turn earned the two “Fight of the Night” honors. While Medeiros lost, he once again showed durability and that he’s got more heart than anyone. I mean, I’ve seen Medeiros get dropped more than anyone and just keep on getting back to his feet. However, I don’t think he’s going to get dropped or hurt in this bout, as he fights the high volume, but no punching power Sean Spencer. It’s no disrespect to Spencer too, who has some solid abilities in the striking department, but the lack of power doesn’t bode well in the UFC. And in won’t bode here either, as Medeiros is going to show us why he still has the talent to make a run in a deep lightweight division. Medeiros via TKO!